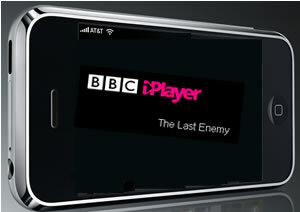 BBC iPlayer is coming to the Apple iPhone. The BBC iPlayer service, that lets UK TV licence players watch selected piece of content that have been shown on TV in the proceeding fourteen days, is going to be usable and playable on the Apple iPhone and iPod touch using WiFi connections. Cellular connections cannot be used to watch the programming as it’s to slow to receive the data, as the iPhone is not 3G. The content will be able to be streamed over on the handset, not downloadable, so the WiFi connection will need to remain constant to watch the programme. No watching it when commuting on the Tube when using this service then. People wishing to watch TV programmes when out of TV coverage will need to use a TV download service. The BBC are unable to provide downloadable version as the iPlayer content is locked into the Microsoft DRM system. The BBC will of course be able to provide a service for the Microsoft Zune, as it’s a Microsoft device that handles their DRM, but having the Zune as they first device to support the iPlayer would have caused a huge outcry from those who object to BBC money being used to create a Microsoft-DRM based system.